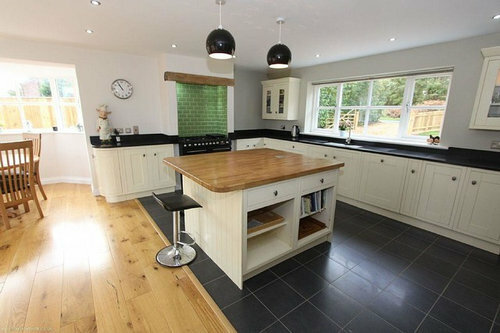 My OH and I are in a debate - he likes the idea of having 2 types of flooring in the kitchen. see pics as examples. I don't know where he has these ideas from but does anyone have similar I can see pics of or what are your views so I can get a balanced opinion of this. Also attached example of what our floor plan will be once the build happens! Personally I agree, can't see the benefits of having 2 flooring types at all but he seems very sure / certain!! Thanks for the pics you shared. I think in the past flooring you had in a living area probably wouldn't be suitable for a kitchen and vice versa. 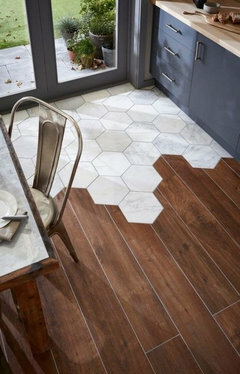 Nowadays most flooring types are so versatile you can use them throughout! Even with the slimmest joining strip there will always be a barrier between the two. 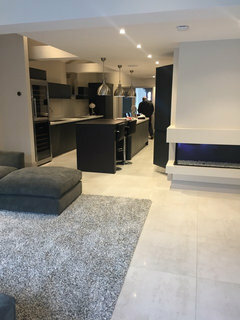 I moved house in December and the open plan living and kitchen had carpet mainly, though tiles in the kitchen area. It seemed a shame to replace but felt it would look so much better if everything was the same. So I replaced with engineered wood floor and also continued this into the hallway. It feels much bigger now, I love it. Personally I think the two flooring thing is old fashioned. I don't like it and don't see why it's necessary. 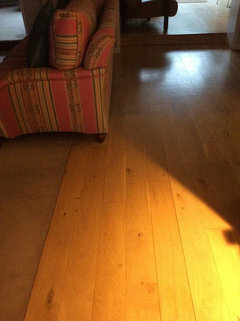 I don't think it adds anything, and much prefer the feeling of continuity you'd get from the same flooring. Not sure what types of floor you’re thinking of laying but I wouldn’t advise putting any sort of laminate flooring in a kitchen even if it says it’s suitable. As a plumber I’ve seen so many laminate floors in kitchens ruined by small water leaks from behind/underneath units. Problem is the water finds it’s way between the laminate and membrane and travels quite a way unnoticed. The first thing the customer sees is the floor lifting by which time it’s too late. When they say ‘suitable for kitchens’ it means it can take the odd spill/heavy objects dropped. There’s loads of porcelain wood effect tiles in all styles and worth the extra spend if you like the look of wood. 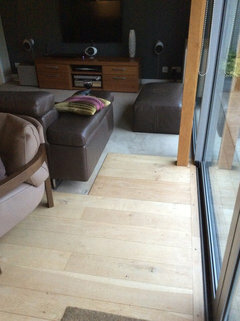 I had carpet and tiles replaced with laminate 5 years ago which runs from the lounge through to the hall and into the kitchen/diner. Big improvement, looks bigger and lighter. 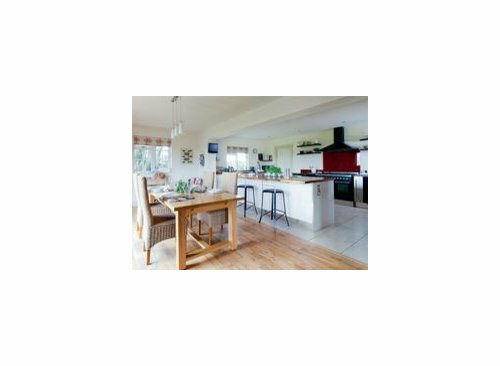 You could also make a feature area around the island like the picture and if you already have Karndean down look at their kaleidoscope range for some inspiration. I tried to read everything but I do not know whether I missed something. My opinion is to have the same flooring throughout but true to find a seller who can serve you with two different materials but same look. Nobody will notice the difference on first sight. But there will be wood or laminate in the dining and tiles in the kitchen. For what it’s worth I would prefer the same flooring throughout. 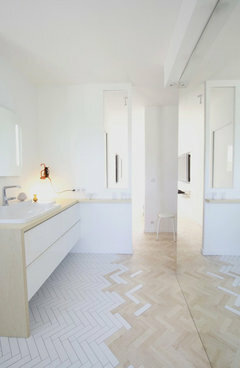 The two different floorings look like a fad that will soon date, if it hasn’t done so already! I very much agree with forzaitalia, if you have a change of material it will always be visible and if you try to disguise this you will not be happy with the result. You need to tread carefully here! Architect son tried to persuade me to use 2 types of flooring but I wanted my kitchen diner to look bigger not smaller and dated. 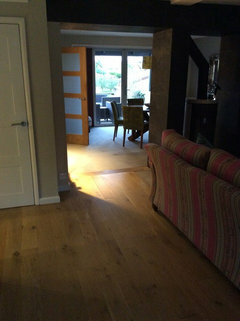 Very pleased with oak floor throughout but I do use a nice carpet runner in front of sink/dishwasher after seeing the damage constant water spills can produce. I prefer the continuity that one type of flooring throughout gives. There are other ways of zoning a space that are better in my opinion, such as lighting or a rug under the dining table/seating area. 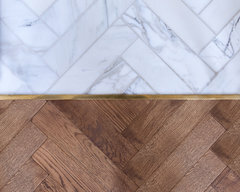 I do however love this example, where herringbone flooring has been matched up. It was in a bedroom and ensuite, so understand the use of different materials. Definitely 1 floor throughout to give a sense of flow and continuity. If you have 2 different floors it naturally divides the room which will make each space look and feel much smaller . 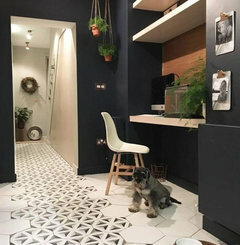 Considering similar but with decorated encaustic tiles marking a path through the hall, curving through the lounge and straight to the kitchen between units and a kitchen island. The rest would either be parquet or a plain tile. Will post a picture for this inspiration. High traffic areas won’t show dog tracks as much in the decorated tile. The same track through the kitchen. I like the same flooring throughout open plan to keep it all as one. Although you could use borders eg around the island & table. Are you having tiles? Underfloor heating? Any children/pets? It’s personal preference, however for me and as an ex estate agent if you do split the floor coverings and create zones you do run the risk of making the room feel smaller. 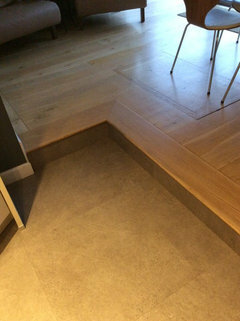 Looking at the design and where the island is, I think it would also bother me if the island was to cross both areas of flooring and encroach into another zone. You’ve got to do what works for you though. You can always use a rug as an inbetween? What a lovely kitchen you have. Can you please tell me how I can make a post as I’d like to seek ideas for my little kitchen? On the page of all the Design Dilemmas there is a box entitled ‘Start a Discussion’. Andersonnix where are you? Happy to help if you are not too far away. It’s go, Go ....... GO !!! – Kitchen / Diner project. Anyone with a layout idea for the following kitchen diner? paint for open plan living room utility and kitchen diner !